With a big increase in the interest of old Vintage BT/GPO telephones, such as the 746 Telephone produced in 1970’s and 1980’s, many new manufacturers have flooded the market with modern Chinese replicas of this iconic telephone. However, don’t be fooled one of the greatest strengths of the original vintage telephone was its robust construction and the superb British engineering of the internal components. Unfortunately, this can’t be matched in these modern inexpensive reproductions. This is particularly true of the sound of the bells, the modern tiny bells used in these replicas are “vastly” inferior in terms of quality and sound of the bell ring. Some modern GPO 746 replicas are not even the same basic shape as the originals, apparently based instead on an American 500 series telephone. Many people who buy these inexpensive replica 746 telephones (made in China) are often very disappointed in these new telephones, as they remembered the original old telephones fondly for the high quality of construction, the substantial weight and the lovely sound of the classic and distinctive bell “ring ring”. The genuine original 746 telephones have a beautiful large complex bell mechanism made of high-quality metals whereas the modern replicas use small inexpensive bells. The sound difference between the two if you put them side by side is huge! As always do your homework, if you have a nostalgic desire for one of these iconic old BT telephones research is the key. You can still buy these original vintage 746 telephones that have either been restored or re-cased, provided you don’t mind using a rotary dial (which I believe is actually part of their charm). Original 746 telephones, restored or re-cased (new plastic case but the original internals and dial) are usually far more expensive than the modern foreign made replicas, however I believe they represent far better value for money as essentially they are still original and have all the iconic characteristics people remember in their vintage telephone (especially the bell mechanism). Plus unlike the genuine vintage telephones the replica’s which have zero collectable value. Don’t be mislead, when you are looking for vintage telephones in the UK you will see a wide range of prices for British Bakelite telephones. The main two things that impact the prices are the condition of the Bakelite and the mechanical service and restoration that the telephone has received. The condition of the Bakelite is usually relatively easy to spot, its a lot like pottery where hairline cracks or significant chips above a couple of mm (nibbles) will massively impact the value (up to 95% or the potential value). So the important thing here is not to just rely on the photographs of the vintage telephones but to ask the seller to confirm that there are no hairline cracks. If they are a reputable antique/vintage telephone restorers they will be happy to confirm this. If you buy from an antique centre always make sure you check the Bakelite in a good light, ideally look at the telephone in sunlight. It is much harder to determine the quality of the mechanical service and internal restoration that the telephone has received. This is one of the main reasons why you will see a big difference in prices from reputable dealers and those on online auctions (or generic antique dealers). If you can’t confirm that this service and calibration has been done correctly your best option is to offer less for the vintage telephone (about 60% less) and then have the telephone serviced elsewhere. Always do your homework and research, there are some dealers that sell via places like eBay that you really would not want to service your “pride and joy” telephone and that really don’t know what they are doing with these iconic telephones, even though they have been in the “Antiques” business for many years. Research, research, and more research. As always word of mouth is always the best recommendation to get a good vintage telephone restorer. Although this site is mostly about Retro Telephones I believe its still worth mentioning the classic British 200 series Bakelite Telephone. These antique telephones were the first Bakelite Telephones to be used in the UK. These telephones were made of Bakelite and had a separate “Bell Set” that contained the bell. However, this “Bell Set” could be mounted underneath the telephone as shown below and the telephone was then called a “combined set”. 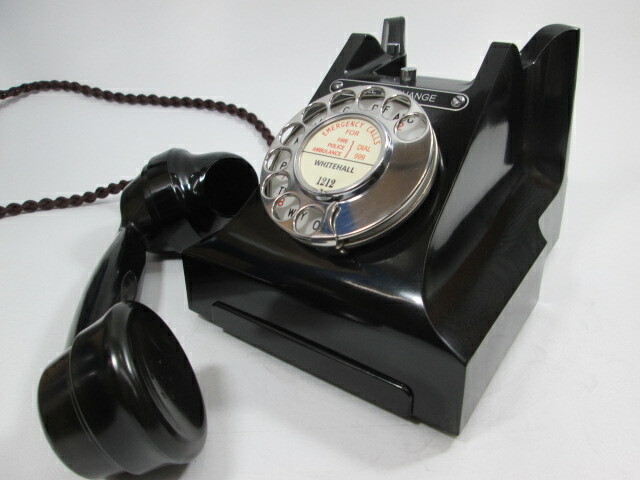 These Bakelite telephones are now regarded as extremely desirable iconic Art Deco phones in the UK (they even work on a modern landline telephone point). These 200 series telephones were predominantly made in the 1940’s, however they were produced for the GPO between 1929 and 1957. These vintage telephones were produced in the standard black, rare ivory, very rare red and extremely rare jade green. Again although not classed as Retro I believe its worth mentioning the most popular British Bakelite telephones (classified as Antique or Vintage), known as the 300 series Bakelite telephones. 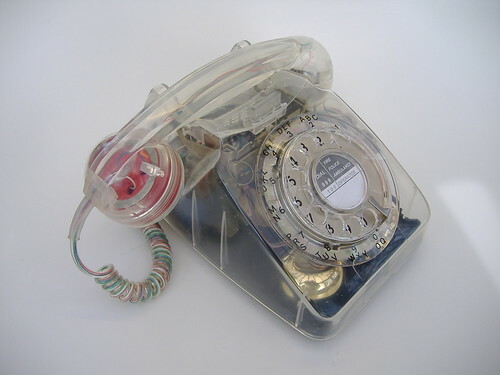 They were the first British Bakelite phones to contain an internal bell. Before this telephones always had a separate “Bell Set”. This superb telephone with its classic hard lines is very sought after today. 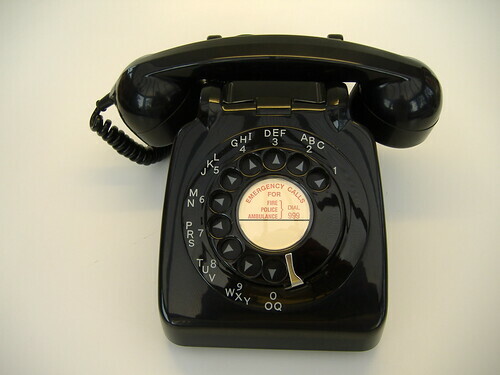 The standard 300 series telephone was known as model 332, although the 300 series range contained several models, usually resulting in extra chrome buttons (above the dial). For example, the model 312 had an extra chrome button for shared service working (when telephone lines were shared with another telephone subscriber due to lack of available wires to the local telephone exchange). The other models with the extra chrome buttons are rarer than the standard 332 and hence they are more collectable and harder to find in “Grade A” condition. In this Bakelite Telephone Era 99.9% of all these telephones were Black. The rarest colour for an antique 332 telephone is Green as in the one above. The model 746 Telephone was first introduced into service in the UK in 1967. This was an improved version of the previous 1960’s 706 model. The 746 case had an integral handle which removes the need for a separate handle (as used on the earlier 706 telephones). The case styling was slightly different from the 706 although it retained the same overall look and feel. The same colour options were available that had become popular with the 706 range. The 746 was later produced with the new style plug type lead (PST and renumbered as was then known as the 8746) this was also converted to high impedance bells to work reliably on the new system of wiring. 746 Telephones produced before the mid 1980’s that do not say 8746 on the base require correct conversion and adjustment to prevent them interfering with the telephone line and potentially causing intermittent problems with both the telephone and Broadband speed/reliability. The classic British Retro Telephone is the 706 (made in the 1960’s). These classic 1960’s 706 telephones were the first modern Plastic Telephones in the UK to be offered in a range of standard colours, such as ivory, red, green, concord blue, topaz yellow as well as black. Before these 706 telephones were produced the standard colour for all British telephone was Black, and although ivory, red and green were made they were very rare, less than 1:10,000 of all the Bakelite telephones in use in the UK were coloured rather than the standard black Bakelite.